Best homemade mac and cheese loaded with cauliflower will trick the pickiest eaters into eating their veggies. Today I’m teaching you a little trick. My granddaughters come over for dinner every other week. Their only request? Mac and cheese. I think I need to buy some stock in pasta, but I digress. Mac and cheese is simple to make from scratch (no need for boxed versions that are full of additives), and is very forgiving in that you can’t really mess it up, even when experimenting with it. In this version, I added cauliflower. The flavor is mild and it wouldn’t set off my granddaughters’ “veggie radar” because it blends right in (as does its color). It also adds a mild sweetness to the dish. Tip: Never reveal your secret! It turns out there are plenty of picky eaters among adults as well, but trust me, you can trick them too with this yummy dish. I’m a real magician when it comes to hiding veggies. I’ve snuck a whole cabbage head into this sneaky casserole and no one ever knew. The veggies are not really hidden in these southwestern egg rolls, but they are so fun to eat. I’m always looking for ways to make comfort foods a bit healthier. Have you snuck veggies into your dishes? How do you make your recipes wholesome? Tell me in the comments! In a pot of salted water cook cauliflower and macaroni al dente according to the package directions. Drain and set aside. In a large skillet heat two tablespoons olive oil over medium-high heat. Add onions and cook until tender, stirring frequently. Add cooked macaroni and cauliflower. Stir in sour cream, milk, cheese, and mustard. Season the macaroni with salt and pepper. Stir well until cheese is melted. Transfer to a casserole dish. In a small bowl mix bread crumbs, parsley, and one tablespoon olive oil. Spread over the macaroni and cheese to cover. Bake at 350 degrees Fahrenheit for 30 minutes or until top is golden brown. Featured on: Jay Tried and True, Pieced Pastimes, and The Cottage Market. You are a very sneaky grandma,,,hiding veggies in the mac and cheese… Love the little crunchy topping too. Wishing you a super 2017! He, he….what can I say? 😉 Thanks, Bobbi, and all the best in 2017 to you and your family! Sometimes we cooks have to be a little sneaky to get our families to eat a healthier. Like you idea of adding the cauliflower, I know I would enjoy your dish very much. Thank you so much, Karen! The healthier you want it to be, the harder it gets. But, one dish at a time and we’ll get there, right? What a great way to get kids to eat their veggies, as well as some adults! Love it! I’m a huge fan of cauliflower, and I love mac n cheese. Will definitely make this recipe! Hi, Michelle. Thank you and thanks for stopping in! I like the idea of combining the cauliflower with pasta rather than replacing it. Sounds good!! Thanks for sharing on the What’s for Dinner link up. I love Cauliflower and this looks like a fantastic way to use it in a dish that is a little different. I can’t wait to try it. Thank you for sharing at Sugar and Spice Link Party. In that case, you will love this dish, Amy! Thanks for stopping in. Hope your weekend is full of blessings! This is a wonderful simple idea. It would lower the carb and calorie count per serving as well as adding vitamins. Most definitely, Leanna! Thank you for stopping in, hope you’re enjoying your weekend! I usually disguise cauliflower in the meals too, it’s not a popular veggie around here. Thanks for another opportunity to make more healthy meals, pinning! Added this to my Yummly recipe box. I’m always looking for ways to sneak in veggies with the kiddo’s favorite meals and sides. Sneaky, sneaky, lol! Thanks for stopping in Donella. Wishing you a wonderful weekend ahead! That does sound like the best cauliflower mac and cheese! Thanks for sharing at the What’s for Dinner party! This sounds yummy! I have snuck cauliflower into our Alfredo sauce, zucchini in a chocolate cake, and pureed carrots into tomato sauce. I have one boy that is quite picky when it comes to anything with vegetables. Pinning this. Pureed carrots in tomato sauce is a brilliant idea! I might even try it for myself as I’m not a carrot fan (unless it’s in a cake, lol). Thanks for sharing and happy 2018! I too make a lot of mac & cheese because my kids’ love it. But I am always concerned about it not being the healthiest of entrees. I have pinned this and will definitely give it a try. I’ve never thought to add cauliflower to mac n cheese, but I bet it’s yummy! Thanks for sharing the recipe with SYC. It really is yummy, Jann! Thanks for stopping in! I am SOOOOO with you on hiding the veggies! For the longest time, I got away with sneaking zoodles in with the spaghetti—and then my picky eater got wise to my trick. Luckily, he hasn’t figured out the cauliflower trick yet! This is a great way to lighten up one of my favorite naughty comfort foods—I mean, who doesn’t like mac and cheese! I would love it like this anyway: no subterfuge needed. But the picky one is another matter…I can’t wait to try this out on him! What an excellent idea! I think I’ll definitely have to try this. I hope you do and I hope you like it 🙂 Let me know! Thanks for visiting. Sounds delicious!! I can’t wait to try this recipe! Thanks, Abbey! Hope you like it! Yum! I love the edition of mustard. Great way to get more veggies and make macaroni and cheese better for me. Definitely better! 😉 Thanks for stopping in. This recipe looks like a winner! All of the ingredients make this recipe look so yummy! 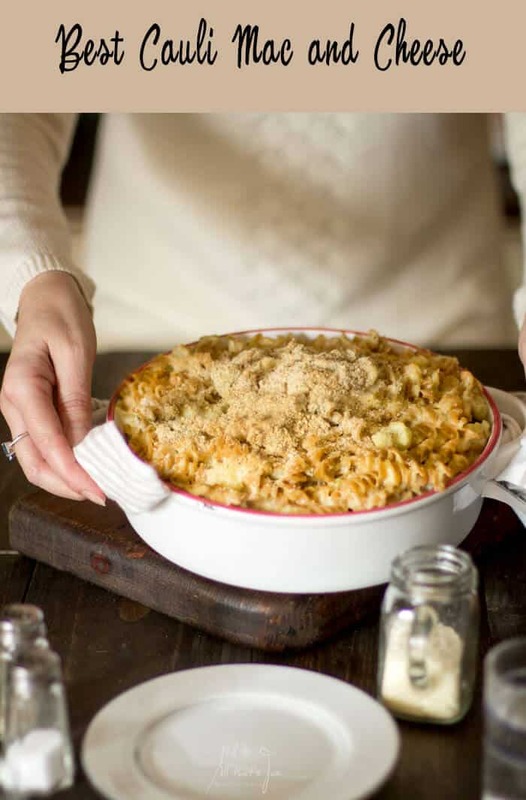 I like that you added cauliflower to a mac & cheese recipe! Hi, Natalie! It fooled my granddaughters, lol. Yes! I’ve been sneaking veggies into my kids Mac and cheese for years. Though mine complain if it isn’t bright orange and has bits of veggies. So frustrating. But cauliflower is definitely one of my go-to veggies to use. Thanks so much for sharing at the #happynowlinkup! Jas, you are making me hungry! This looks scrumptious!! Thanks for sharing this at Fiesta Friday! I love cauliflower and mac and cheese so this basically blows my mind hehehehe. Thanks for sharing at Friday Frenzy Link Party! PINNED! 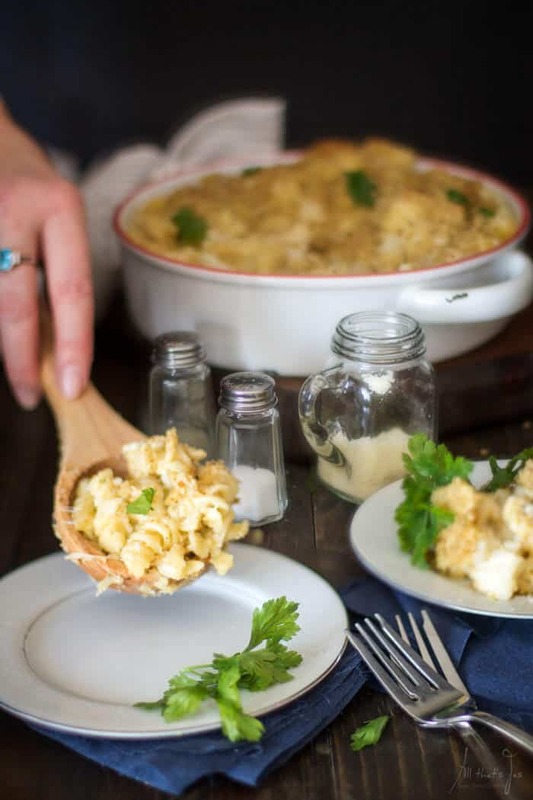 This sounds absolutely delicious, I love cauliflower cheese and this makes it possible for me to have it as a whole meal! Thank you, Kat! It could definitely be a whole meal. 🙂 Thanks for stopping in! I can’t wait to try this recipe it looks very comforting to me. Happy to see you here at Full Plate Thursday and thanks so much for sharing with us. 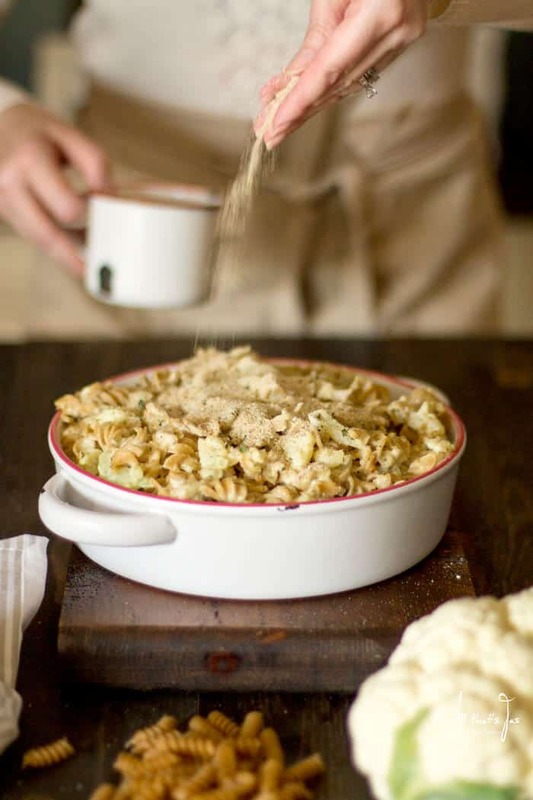 What delicious winter comfort food! I love the addition of cauliflower! I love to hide veggies in meals 😉 And this one is definitely to try! I think Junior would love this one! 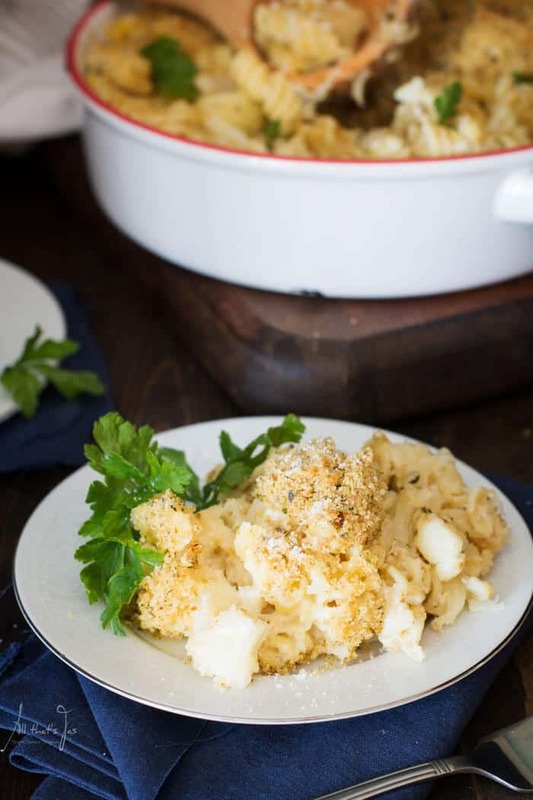 I love mac & cheese and I love to add cauliflower! Perfect for sharing, thanks for bringing it to Fiesta Friday! Hi, Christina! I hope you’ll give this one a try. 🙂 Thanks for visiting! I love that this recipe takes a comfort food and adds a healthy ingredient! Pinning for later. I am visiting from Friday at the Fire Station link-up. This is definitely a great way to ‘hide’ veggies deliciously, Jas! I like that you use low fat sour cream too. Pinning and sharing. Thank you for sharing, and for being a part of the Hearth and Soul Link Party. Hope you are having a good week!